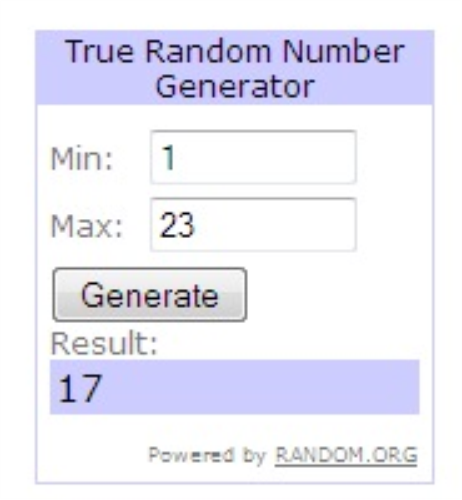 Before introducing you to challenge 18, I want to thank all those who entered challenge 17, which wasn't an easy one - there weren't quite so many players as usual, but I guess that with Easter having just been and another Bank Holiday yesterday, making Christmas cards has been put down the list a bit. Well, today's challenge 18 is easier than last week's - all you need to do is use a die cut - it can be one that you have cut yourself using a nestie, a sizzix or other similar die, a craft robo or cricut shape that you've cut ... or even a bought ready-made die cut - how easy is that?! 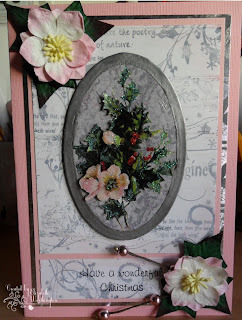 I used a Nellie Snellen die cut (ran through my cuttelebug) for my card - you can read further details here on my regular crafting blog 'My crafty outlook' and also see what other challenges I entered with it. 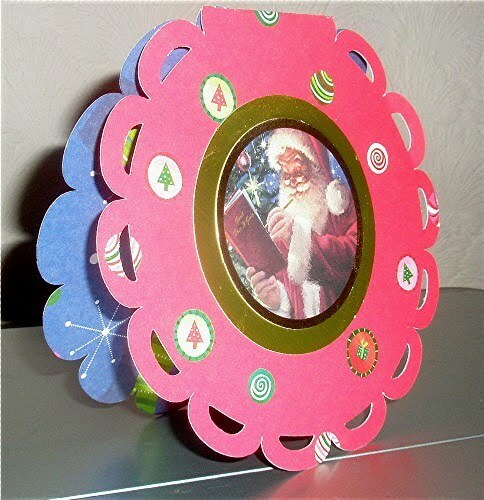 As usual, you can use any materials, any techniques, as long as the end result is a Christmas card - and this week please remember to use a die cut - apart from that, anything goes. I look forward to seeing what you come up with for this challenge - please add a link to your blog post (not your blog, but the actual post where your card can be found) by 22:00 UK time Friday 6 May. Please mention my blog and create a link within the post for your creation. A new challenge will be set on 7 May - and as this will be the first challenge of a new month, there will be a randomly drawn prize. If you haven't done so already, please become a follower and grab my bright pink button to post on your sidebar and help continue to spread the word about this new challenge blog - thank you. I think this challenge has been a tricky one and I admit I wasn't really that happy with my card for it, so I decided I would try and make another one. You can read details about it on my regular crafting blog here, including links for other challenges - I would encourage you to support the other Christmas challenges out there on the net - we are all working towards the same aim of building up stocks of Christmas cards throughout the year. Please scroll down for challenge 17 or click here. Thank you for the entries so far - it would be lovely to see even more joining in before the deadline of 22:00 UK time on Friday 29 April - you've still got time! This year is going so fast - it doesn't seem possible that we're already in the midst of the Easter weekend, especially as Easter is late this year, so this means that we are on challenge 17 today - where have the last 16 weeks gone? 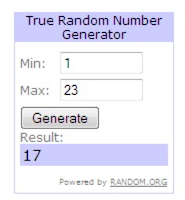 Anyway, before we get to today's challenge I just want to thank all those who entered challenge 16 - I had great fun, not only seeing all the cards, but also singing along with the songs. There are so many of you who are regularly supporting these challenges - thank you so much - and it's also good to still see new crafters joining in. It's never too early (or too late) to start building up a stock of Christmas cards, so, if you haven't started yet, why not start with today's challenge? Meanwhile, best wishes to everyone for a Happy Easter. So for challenge 17 I'd like you to bring a touch of Easter into your Christmas crafting. Yellow is a colour we associate with Easter and, of course, it's a time of year when eggs feature (oh yum, I know that I'm getting a Hotel Chocolat dark choc egg) and, of course, eggs are oval in shape. So I'd like you to use either the colour yellow - little or a lot (you can use other colours as well, as long as yellow is visible) and/or an oval shape on your card. I'm not too sure about my card, but, hey ho, 'tis done now. Details, including links to other challenges, on my regular crafting blog 'My Crafty Outlook' here. 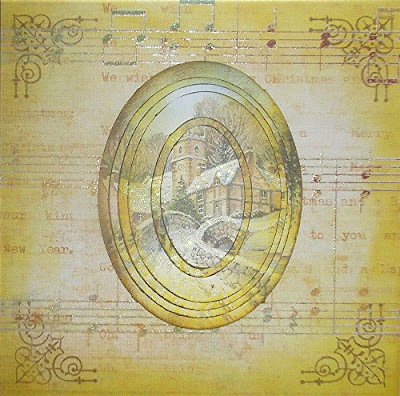 As usual, you can use any materials, any techniques, as long as the end result is a Christmas card - and this week please remember to use yellow and/or an oval - apart from that, anything goes. I look forward to seeing what you come up with for this challenge - please add a link to your blog post (not your blog, but the actual post where your card can be found) by 22:00 UK time Friday 29 April. Please mention my blog and create a link within the post for your creation. A new challenge will be set on 30 April. Thank you to all who made cards 'going round in circles' - once again there was a great variety of all kinds of Christmas cards incorporating all sorts of circles - from small dots to big round shapes. It's good to see so many regularly entering the challenges and also lovely to see some new entries. 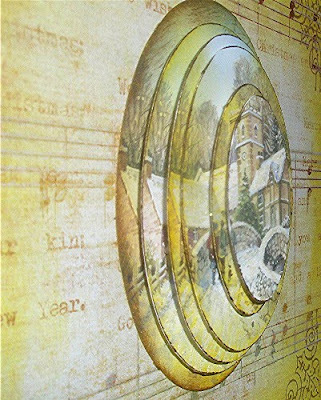 This week's Challenge 16 is to make a Christmas card inspired by a Christmas song or carol - I hope this gives plenty of scope. 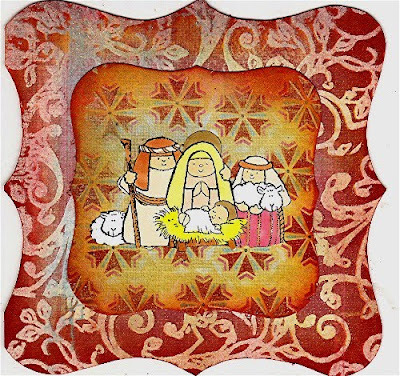 My card is based on 'Away in a manger' using the Penny Black 'the manger' stamp coloured with copics - I kept the colours fairly subtle to tone with the My Mind's Eye papers from the Christmas Glitter book. These already have a distressed look, but I further distressed edges, first with spiced marmalade DI and then fired brick. The inner shape is a nestie, so I'm linking this for Jingle Belles challenge to use die cuts - their challenge this time is 'cross-pollinated' with Betty Bee's Buzzing honeybee challenge, so I'm linking there too. 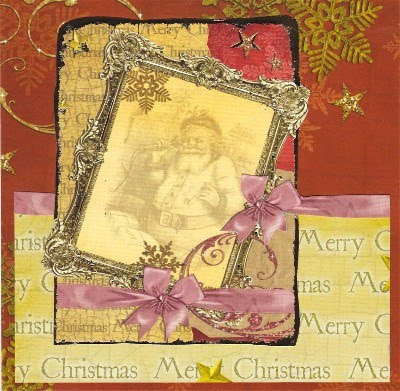 As usual, you can use any materials, any techniques, as long as the end result is a Christmas card - and this week please remember to base your card on a Christmas song or carol - apart from that, anything goes. I look forward to seeing what you come up with for this challenge - please add a link to your blog post (not your blog, but the actual post where your card can be found) by 22:00 UK time Friday 22 April. Please mention my blog and create a link within the post for your creation. A new challenge will be set on 23 April. Please email me, Elizabeth, so that I can let you know how to claim your prize - either 5 digital stamps or 4 digital stamps and 1 paper pack kindly given by Robyn's Fetish Digital Stamps and More, the sponsors of my challenge 14. Now on to challenge 15: going round in circles. 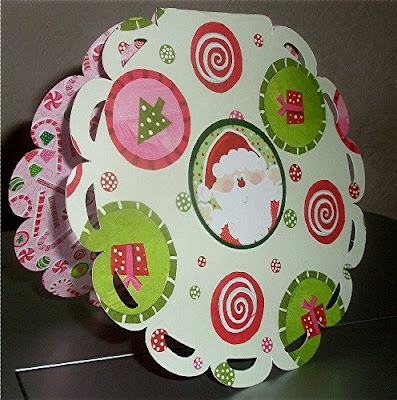 I'd like to see at least one circle - it might be the shape of your card, but it doesn't have to be - you can use paper with circles on it, die cut circles, dots or spots ... or even buttons or brads - as long as you use something round it will count. We are actually having a break away atm, so I quickly prepared two cards for this challenge before we left home (and I have my little lappy with me and hotel internet connection) - time was running out so I needed to produce something quickly so I used Cricut wild card cartridge doiley card with some K & Co Christmas double sided papers (these were some of those that were sent to me by the lovely girls at the Order of the Opus Gluei. Just the addition of a central image and the cards were done. As usual, you can use any materials, any techniques, as long as the end result is a Christmas card - and this week please remember to include at least one circle - apart from that, anything goes. I look forward to seeing what you come up with for this challenge - please add a link to your blog post (not your blog, but the actual post where your card can be found) by 22:00 UK time Friday 15 April. Please mention my blog and create a link within the post for your creation. A new challenge will be set on 16 April. 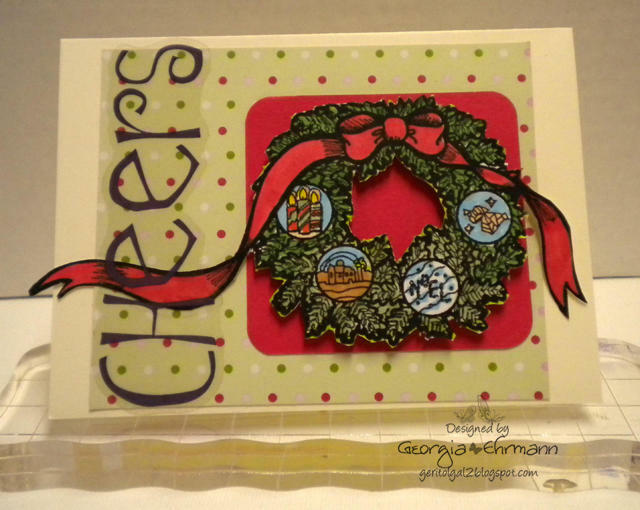 Before I get to this week's challenge I want to thank all those who entered last week's challenge - it was lovely to see lots of 'regulars' cracking on with building up their supplies of Christmas cards and also to welcome new folk along. If you haven't started your Christmas cards yet, just be aware that a quarter of the year has already gone (I know, it goes so quickly, doesn't it?) - and what better time to take part than today's challenge which is being sponsored. I am so excited about this new challenge because, not only is it being sponsored by Robyn's Fetish Digital Stamps, but one of their girls, Georgia, is joining me as a Guest Designer - more about that later. Robyn's Fetish Digital Stamps and More will award either 5 digital stamps or 4 digital stamps and 1 paper pack of the winner's choice. You can see more of Georgia's beautiful crafting on her blog: PaperPossibilities ... Toadily Handmade! Please hop over to Georgia's blog and leave her a kind comment. I also used Robyn's Christmas Wreath and also her Corner Holly. 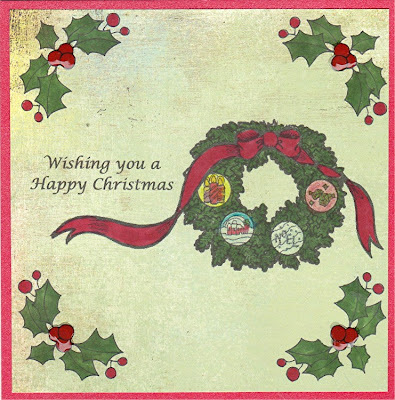 I arranged the images and my own sentiment in Publisher and printed on to Basic Gray Winter Mint paper and coloured with copics, adding some glossy accents to the centre berries of the holly corners. 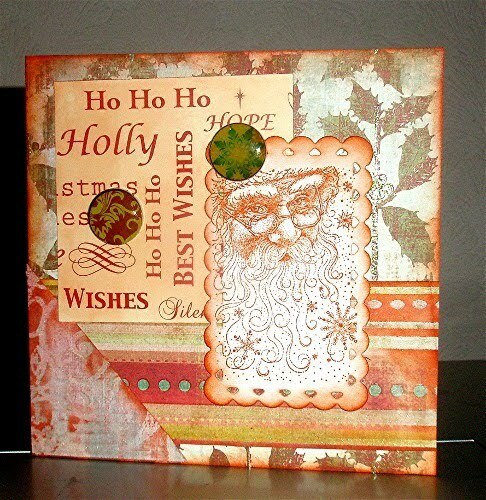 So here is my card - you can read more about it on my regular crafting blog here. As usual, you can use any materials, any techniques, as long as the end result is a Christmas card - and this week please remember to include some Christmas foliage and/or flowers - apart from that, anything goes. I look forward to seeing what you come up with for this challenge - please add a link to your blog post (not your blog, but the actual post where your card can be found) by 22:00 UK time Friday 8 April. Please mention my blog and create a link within the post for your creation. You can enter as many times as you wish (a good way to build up your stock of Christmas cards) and also link to any other challenges that allow you to do so, but new work only, please. And don't forget that a randomly chosen winner will be able to choose 5 digital stamps or 4 digital stamps and 1 paper pack. As you can see from our cards, there are some delightful Christma s images to choose from, as well as a host of others. A new challenge will be set on 9 April.